Playoff hockey is just around the corner, and with a week to go the Pittsburgh Penguins are in 2nd place in both the Metro and the Eastern Conference with 100 points and 3 games remaining. It's not an unfamiliar position for the team, as they've finished with the first or second most points in the conference 4 times in the 6 season since winning the Stanley Cup and third in one of the other years. But despite the regular season success, the team hasn't followed through in the postseason, making the Eastern Conference Finals in just one year and having a string of heartbreaking eliminations. The Pens were a team that blew a 3-1 series lead not once, but twice over those six seasons, first without Sidney Crosby or Evgeni Malkin in 2011 against the Tampa Bay Lightning, then again in 2014 against the New York Rangers that cemented Dan Bylsma and Ray Shero's fates. They looked primed to make a run in 2012 when Crosby returned for good from his concussion, but the high flying team in the final weeks of the regular season threw composure out the window, losing to the Philadelphia Flyers in the 1st round. And it's impossible to forget 2013, when the East's top seed and the NHL's top offense looked helpless against the Boston Bruins, bowing out in 4 games and with only 2 goals scored for their trouble. Year after year this happened, with the expectations getting higher while the results got progressively more disappointing. And year after year it became more difficult to muster enthusiasm for the team. The regular season? Wake us when the real season starts. The opening round of the playoffs? They better not blow it. The two Stanley Cup Finals appearances and the Cup win in 2009 might have come too quickly for the good of the fanbase. We had so much success, so soon, with such a talented young roster that we immediately started looking to the future instead of enjoying the great team in front of us. 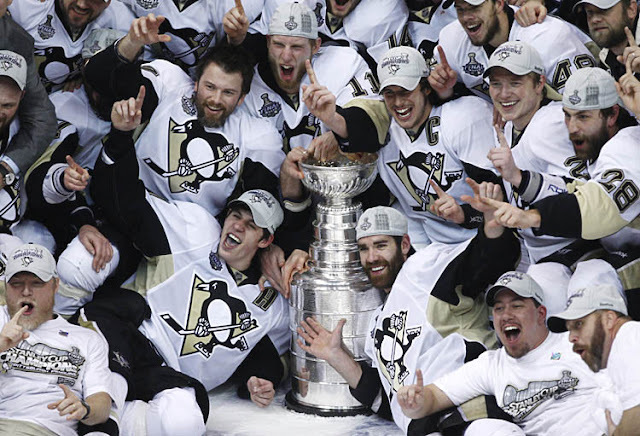 Yes, Pittsburgh always had teams that could be in a position to win the Stanley Cup, but winning it all is much more difficult than it seems even for the top teams. The expectations were out of whack, the "Stanley Cup or bust" mentality was a drain on every fan's psyche, and soon the spring became a time of dread instead of a time of hopeful wishing. The reset button needed to be pressed - let this improbably season be the one that does it. After the way the team limped to the finish line last year, and the lifeless start to the season under Mike Johnston, it appeared the best days could be behind them. The offense had the life sucked out of it by a coach more concerned about preventing goals than making sure Pittsburgh scored more than their opponent. The gifted offensive players were stifled by an approach that zapped them of their creativity and ability to get good scoring opportunities. If there's one thing Johnston irreversibly killed, it was the belief among the fans, and maybe some of the players themselves, that these Penguins, this core of Crosby, Malkin, Letang, and Fleury could just show up and find themselves among the better teams in the league. They were battered and beaten to quite possibly the lowest point they've been since the 2005-06 season, but maybe we needed that. Maybe we ALL needed that. Because at that low point, Mike Sullivan was able to come in and build this team back up in the right way. He was able to recognize that such a talented group of forwards with a weak blue line needed to force the issue in the other team's offensive zone, not waste their time trying to bunker down in their own end. The team needed to rely on the strength of their goaltenders to back them up when things broke down. The Pittsburgh Penguins needed to start playing like the Pittsburgh Penguins. The team started playing better under Sullivan almost immediately, even if the results weren't always there. And the reinforcements started coming in from the most unlikely of places. Trevor Daley was run out of Chicago, viewed so lowly that the Blackhawks preferred having Rob Scuderi and some cap relief than the veteran defenseman, but Sullivan put him in a position to play to his strengths and worry less about the deficiencies in his own zone. Justin Schultz has seen a similar transformation after beaten down in Edmonton and is flashing the offensive talent that made him such a coveted player coming out of college. Carl Hagelin has added game changing speed that has reinvigorated the team around him, especially Phil Kessel, who had been struggling in his first season in Pittsburgh before being teamed up with the Swedish winger. And a string of injuries at forward didn't doom the Penguins. Rather, the AHL callups showed that the prospect pool was a bit deeper than everyone was led to believe, and they've continued to improve with each passing game to the point that they've turned the bottom 6 back into a strength, and they've added a drive and hunger that has been conspicuously missing the past few seasons. With the playoffs a week away, this team is in a position that would have been unfathomable in mid-December. Pittsburgh has gotten stronger with each month under Sullivan, and they're riding high with wins in 12 of the last 13 games against the most brutal stretch of their schedule. They haven't just been beating good competition; they've largely crushed whoever has been placed in front of them, outscoring teams 55-26 over that time frame while dominating in possession with a 59.6 SACF%. In fact, they've been an elite possession team since Sullivan's first game as they're 2nd in the league since he took over with a 55.8 SACF%. The Pens have had their fair share of playoff disappointment recently, but this time it feels different. It wasn't supposed to be this team playing with the best in the league. This team wasn't supposed to be destroying their divisional foes in March, and this coach wasn't supposed to be anywhere near the city limits. Anything can happen once the puck drops on the playoffs, but this team feels like something special is about to happen. It's time to throw expectations out the window and simply enjoy the ride as it's happening. It's time to let yourself get excited about the Penguins again, Pittsburgh.